optimistic.relaxed.dreamy.happy.kind.movie buff.shop girl.frustrated artist.sassy.sweet tooth.musically inclined.reliable.expressive.free spirited.adventurous.wacky.cowgirl.confident.thoughtful.lovable. Hey dearest blog.. I almost forgot about you. I'm deeply sorry for not giving you some updates. It's just that there's not much to blog about. Ever since Hon left for Japan, my life became kinda dull, repetitive and melancholic. You know what I mean. I just want this year to end. I still love Christmas though. At least there's something to look forward to. Mom and Dad will be here with us so that'll be more fun and it means more food on the table. I just need to control myself from eating too much. It's hard to lose holiday fats. Haha! Not to forget the 13th month pay! What am I gonna spend it on? Well, I'm planning to buy myself a laptop. Hon will buy it for me in Japan so it will be cheaper. I think this will be my biggest investment yet. I'm eyeing for the HP Pavilion DV4T with awesome specs. I hope something better or an updated version will be out by December. Hon will be helping me to get a great deal. Can't wait! 'Till here for now. Gah! Wake me up when November ends. ♫ "It's been exactly 3 months..
since you went away... I miss you so much and I don't know what to say. "♪ Hehe! Parang song lang ni Brian Mcknight eh noh?! LOL. 2.) Our office moved to Burgundy Corporate Center. 3.) During the first week/s after Hon left, some of my officemates told me I’m getting thin.. Hmm.. Weh?I dunno about this. Haha! 4.) Secured an NBI Clearance. 5.) Watched Transformers 2 with iBerks friends at Robinson Galleria. 8.) … so I scheduled a movie date with my guy best friend. We watched HP6. I guess that was the first time I watched a movie with him alone. I think we should do that more often. 9.) Mom & Dad just got back home last July 16. 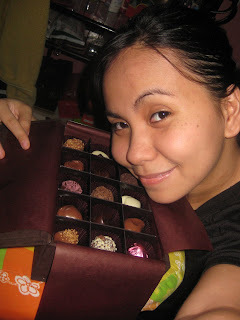 Imported chocolates became my depression medicine. Sosyal! And I didn’t care if I get fat. 11.) Therapeutic massage with Mom last July. 12.) 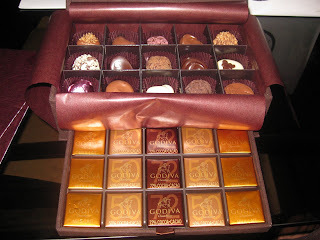 Received Godiva chocolates from Hon. 13.) Watched G.I Joe with Sis and Bro. 15.) Watched And I Love You So with Mom. 16.) Aroma Swedish massage with Sis last August. 18.) Learned how to bake brownies. *ahem ahem* Triple Chocolate Walnut Brownies. 19.) Spent most of my time watching movies on my iPod. I guess that’s it. Parang ang bilis lang ng 3 months pero nasa 1st quarter pa lang ako sa 1 year span of waiting. Lol. How depressing. *sigh* On the brighter side though, I’m doing this for us. He kept on saying that my wait will be so worth it. Besides, I’ll be going to Japan by 2nd quarter of next year. I can’t apply for Japan visa yet without a latest ITR. (#$%@$%!!!) I’ll have to wait for January 2010 so I can receive my ITR. Sad. Na-extend na naman ako. Grrr talaga! Joni's new biz -- cute beaded colorful flip-flops (handcrafted by her). You won't find 'em anywhere! Aren't they super CUTE to wear on your footsie? Shipment is within the Philippines only. ...you'll literally never know what you're gonna get. This is the golden "surprise" of my Honey. 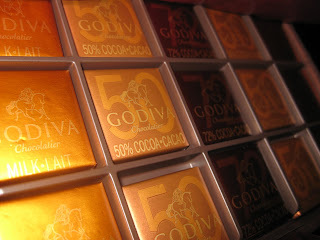 The prestigious brown box was wrapped in a golden paper topped with embossed Godiva logo. I just finished my dinner and time for dessert. I can't resist to have a bite. What the hell, they're chocolates! And I'm a chocoholic. 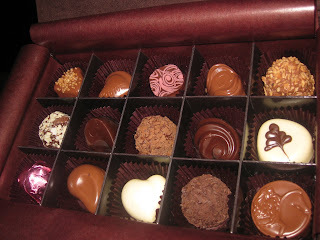 I picked the round truffle with the lady in a horse figure on top of it. First bite was heavenly. I almost forgot my name.. Woah! Thank you so much Hon!!! I promise not be greedy and share it with my family. Hehe! Alam ko medyo matagal pa ang pinaplano kong bisitahin si Hon sa Japan pero at least I'll have enough time to save money for the plane ticket and complete the requirements for the Japan visa. I have visited the Japan embassy website and I was quite shocked by the number of requirements I have to submit. I have 4-5 months. That's more than enough time naman siguro.